An original Edwardian shopfront featuring twisted wrought iron columns and arched windows, houses a really useful little shop with it own on site workshop. Resizing, soldering, restringing, valuations and machine engraving are carried out on the premises. Most jewellery stock is second hand and new jewellery is made on site in lots of different styles from antique to biker gothic in both gold and silver. We stock a good selection of diamond rings for men and ladies, antique silverware and restored quality watches such as Omega, Longines, Gucci and Raymond Weil. Watch batteries and replacement straps are changed while you wait. There is also a large selection of hand painted model soldiers from W Britains, Kings and Country. Also vintage Dinky and Solido military die cast models. 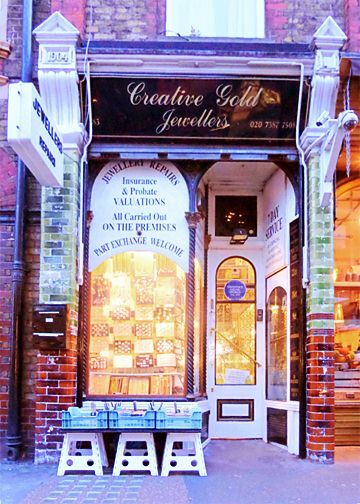 Creative Gold Jewellers have a large selection of badges, medals and military insignia and military uniforms are available for hire. Open to 7.30pm five days a week. Opening times may vary. Please phone ahead to check that I am in.